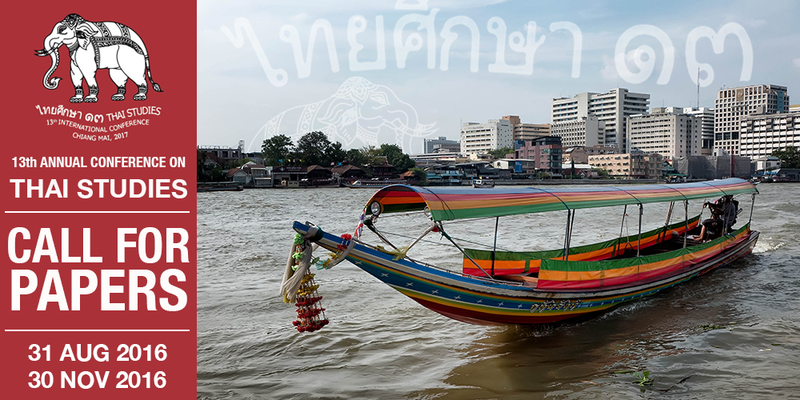 The 13th International Conference on Thai Studies aims to bring up to 600 Thai, regional, and international scholars together to present their research work and works‐in-progress. Two types of submissions are now being accepted for the 13th International Conference on Thai Studies: 1) individual abstracts and 2) panel proposals. The submission of individual abstract and panel proposal can be made online on the conference website (link will be added when available). Individual abstracts should not exceed 250 words. The deadline for individual abstract submission is 30th November 2016 and panel proposals is 31st August 2016. Notification of acceptance of proposals will be made by 31st January 2017. Participants may of course submit panels and papers with titles that may not exactly match these suggested themes, yet represent current or critical issues for Thailand. All papers presented will be included in the E‐proceedings and will be available on the conference website. A selected number of papers will be chosen for publication in international‐level academic journals which are in partnership with the conference.